I found this article today and thought it might help some of you. It’s always good to know some home care and preventive remedies. Taking an antihistamine isn’t the only way to battle fall allergies. If seasonal sneezes — not to mention a runny nose, watery eyes and congestion — are making you miserable, there are some foods that might ease your pain. Just know that none of these noshes replace traditional allergy treatments. “[They] have anti-allergic properties … [but] none of these can be used in place of medications in patients who have severe allergies,” Talal M. Nsouli, M.D., a clinical professor of pediatrics and allergy-immunology at the Georgetown University School of Medicine and spokesperson for the American College of Allergy, Asthma and Immunology, told weather.com. But certain foods can help, which can be key for your health. DHA and EPA, two types of healthy omega-3 fatty acids found in fatty fish and other sources, have been known to ease allergy symptoms. “If we eat foods that contains these omega-3 fatty acids, the EPA and the DHA, [there’s] an anti-allergic property [and] decreasing of the allergic reaction … to a certain extent,” Dr. Nsouli said. Eating your omega-3s — as opposed to taking a supplement — is the best way to go about it, as numerous studies have shown that the health benefits of vitamins, minerals and healthy fats are most effective — or even only effective — in food form. Quercetin, a flavonoid found in some foods, is believed to help reduce the inflammation associated with allergies. The thought is that it prevents immune cells from releasing histamines, or an allergic response. Vitamin C is thought to help control allergy symptoms; like omega-3s, it’s best to get your C from foods, not supplements. Oranges, red peppers and strawberries are some of the fresh fruits best known for their vitamin C content. 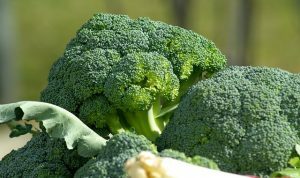 It’s also in broccoli and other foods that contain quercetin. Recently, a study — the most rigorous to date — demonstrated that garlic extract can help decrease an allergic reaction and can help prevent allergy by blocking the production of the chemicals that cause allergic reactions, Dr. Nsouli said. Some research has found that the probiotics, or bacteria, contained in yogurt reduce allergic reactions to pollen, helping the symptoms of allergic reactions in children Dr. Hakimi said it’s because these probiotics help decrease the body’s immune response to allergens, reducing inflammation in the body. Digestive enzymes can also help, he said. But some individuals have reported issues with allergies and dairy products. If you think dairy might be a problem, try an “elimination challenge” test. Go off all dairy products for two weeks to see how you feel, then add in two or three portions of dairy a day for two weeks, and compare how you feel. During this process, it’s also important to check in with an allergist to confirm what’s bothering you, and explore other treatment plans. A native Indian spice found in curry and other dishes, is known to have a powerful anti-inflammatory response. You can spice your food with this brightly colored powder, or take supplements — it just depends on what works with your lifestyle. Foods rich in magnesium are believed to help control allergies. But it also opens up and relaxes the muscles, which can be beneficial as well. High-magnesium foods include cashew nuts, wheat bran and kelp. Thanks for reading. I hope it helps. This article was posted in Natural Remedies, Uncategorized. Bookmark the permalink. Follow comments with the RSS feed for this post. Both comments and trackbacks are closed.